All of the Afghan people I’ve encountered here have been warm and welcoming. Of course, I’m living in a relatively safe bubble created by the community around ANIM, with no opportunities to mix outside of that community. Thanks to my connection to Baset Azizi, a trumpet student at ANIM who will be coming to Interlochen in Michigan to study this year (this is another story, in which my wife Robin played a central role), I was welcomed by Baset’s extended family for the main meal last Friday (the “weekend” here) along with a trip to the hilltop where the giant Afghan flag donated by India flies. 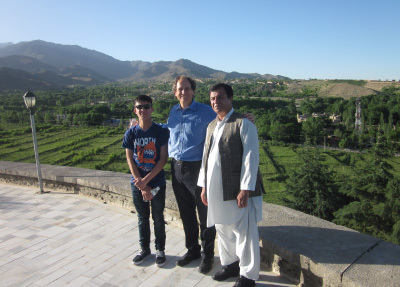 With Baset’s family, I had the opportunity to meet ordinary (albeit relatively well off) Afghanis, and to enjoy some of the hospitality and fantastic food that this country is famous for. Of course, the limitations for an American here are very real and not always easy to deal with: I have been reminded that it is not safe for me to walk (or run) the streets here. How I’d like to be able to go out for a walk in the morning, when it’s still relatively cool and the dust hasn’t risen yet, and enjoy the busy streets. How tempting to go and hike in the nearby hills. For two weeks, I’ve had to deal with the confinement of walled compounds and cars to get from one to the next, with the exception of some rare and wonderful strolls at Paghman Palace, and at a couple spots in Kabul. The Afghans certainly have no compunction about walking everywhere—often in the streets, since sidewalks are torn up in many places. (To be improved or replaced? Or is this permanent?) And the scene on Friday at the hilltop park we visited was of extended families picnicking on the shaded grass surrounded by generously blooming rosebushes. In terms of the teaching, I’ve continued to enjoy working with the ANIM students, teaching piano, flute, marimba, and clarinet (! ), as well as conducting three of the student orchestras (the large orchestra, the girls’ orchestra, and the chamber orchestra) and supervising the student conductors of these ensembles. I look forward to and hope for another opportunity to work with these students! Today’s teaching was wonderful, but also a bit sad: hard to say goodbye to all these wonderful people, especially Arson, Bilal, Waheed, Tarunum, Moustafa, Zerifa, Nazira, Sima, Feiruza. Best was seeing Zerifa blooming as a conductor, after only a week. We worked together today for 45 minutes, mostly talking about rehearsal technique and people management, and then she led most of the rehearsal with the Girls’ Ensemble. She’s a natural leader, and she knows which questions to ask. The students responded well to her, and treated her with a great deal of respect. And she was good at hearing problems and working on them. I’ll look forward to seeing what she does going forward. Most of all, working with people like her makes me want to come back to Kabul and ANIM, to help the students continue to progress.